Blog from Wellington, New Zealand | Where is the Love? 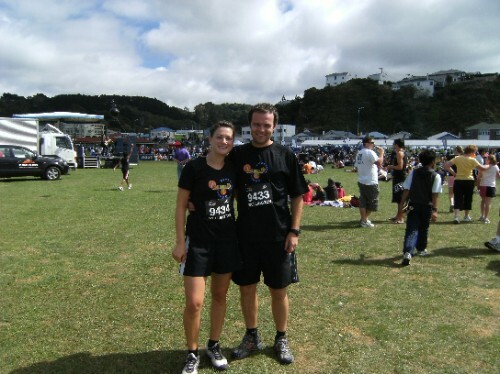 We signed up with the Les Mills team from the gym to do the 7k fun run rounds the bays in Wellington.We joined the gym team because it meant Brian got a free gym membership until the day of the run, free t-shirts and most importantly a sausage sizzle at the end of the run (more on this later!). The run started in Wellington city centre and went out along the coast for 7k.It was pretty scenic but I don't remember taking much of it in during the race.I was pretty pleased with my time of 33 mins 54 seconds, a new PB for me!I was feeling good, until Laura joined us for the last 1k, having completed the race herself in 25 mins! And run back to meet us!Drew wasn't far behind Laura's time either. After the race we made our way to the Les Mills tent.Brian certainly abused the sausage sizzle by going up about 5 times.He tried to change his accent each time so they wouldn't recognise him.We did pretty well out of the Nike spot prizes too.Through rolling a double on the dice we got a Nike cap, water bottle and socks.So I think we took full advantage of Les Mills that day!